You can use any yarn of your choice to make it your own. This quick and easy crochet scarf would make a great Christmas or holiday gift for friends and family or even a beautiful handmade piece to sell. I recommend hand washing the crochet scarf with cold water and mild soap, ring it out gently & lay flat on towel to dry. If your using cotton yarn, heat can shrink your top so be careful! Leave me any questions you have from this crochet tutorial in the comments & I’ll get back to you guys. Thank you all for watching & please let me know of other crochet ideas or DIYs you’d like to see. 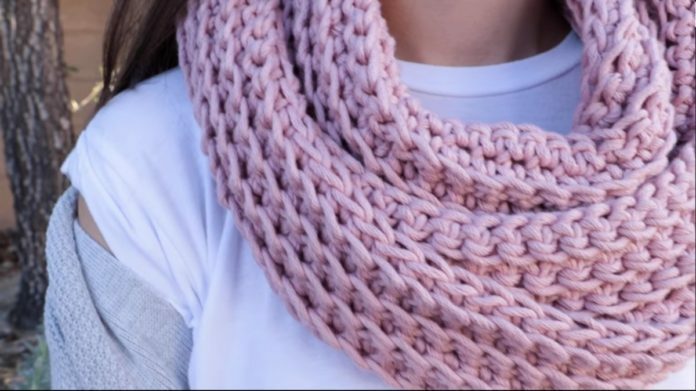 In this tutorial, Amanda Love Santos shows how to make a scarf with a chunky crochet infinity design that has a knit scarf look. She shares free crochet scarf patterns and more on her channel. Previous articleDIY Crafts : Add some lace to some old jeans. Life Hacks Ideas: 16 SCHOOL LIFE HACKS!